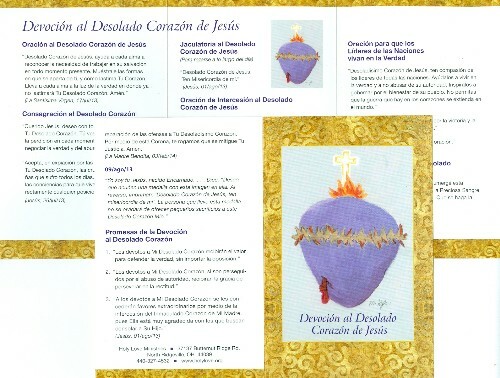 Spanish trifold prayer card includes the Prayer to the Mournful Heart of Jesus, Consecration to the Mournful Heart, Mournful Heart Ejaculatory,Mournful Heart Intercessory Prayer, Prayer of Supplication to the Mournful Heart of Jesus Prayer for Leaders of Nations to Live in Truth, Prayer of Petition to the Mournful Heart of Jesus, Chaplet to the Mournful Heart of Jesus,and the Promises of The Mournful Heart Devotion. 1. "Those devoted to My Mournful Heart will be given courage to stand up for the Truth, no matter the opposition." 2. "Those devoted to my Mournful Heart, if persecuted by the abuse of authority, will be given teh grace of perseverance in righteousness." 3. Those devoted to My Mournful Heart will be granted remarkable fabors through the intercession of My Mother's Immaculate Heart, for She is most thankful to those who seek to console Her Son." 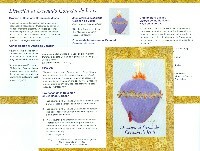 Front of prayer card measures 3.5 in. x 5.5 in.